Home » Blog » Fatal Commercial Truck Accidents are on the Rise on Texas Highways. A Texas Truck Accident Attorney Fights to Hold the Trucking Industry Accountable. Fatal Commercial Truck Accidents are on the Rise on Texas Highways. A Texas Truck Accident Attorney Fights to Hold the Trucking Industry Accountable. 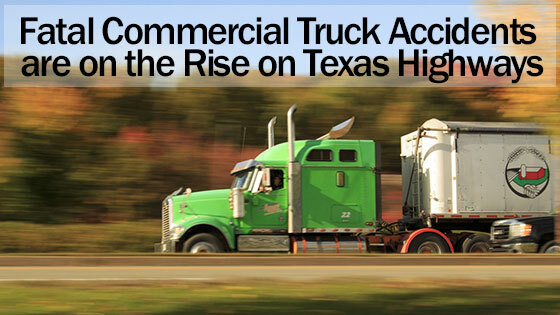 Although the economy is booming across Texas, an unfortunate side effect has been a rise in truck accidents. Part of the reason behind the increase is simply that there are more trucks on the road due to growing industries in the region, including oil and gas. When you add in the changing regulations that govern driver sleep schedules, the odds of being involved in a truck accident rise even further. If a loved one was involved in a fatal accident with a commercial truck in Texas please contact an experience commercial truck accident attorney from the Law Office of David Kohm. According to data gathered from various transportation safety sources in 2016, the most recent year for which data is available, there were 4,213 fatal crashes involving large trucks in the United States. This represents an increase of three percent from 2015. In 2016, there were also nearly 120,000 injury crashes involving large trucks, an increase from 97,000 injury crashes in 2015. Combined, this data clearly shows that the trend in recent years is an increase in both fatalities and injuries involving large trucks. Unfortunately, truck accidents lead to a host of serious injuries, and as demonstrated above, truck accidents can also be fatal. Part of the reason truck accidents are so dangerous is simply due to the size, weight and speed of trucks involved in such accidents. Injuries caused by truck accidents may include broken bones, internal bleeding, damage to muscles and joints, anxiety and depression, traumatic brain injury and much more. It’s also important to note that fatalities caused by truck accidents may not occur immediately, but instead, they may happen later as a victim succumbs to various injuries that do not get better with time. Representing clients in the Dallas, Fort Worth, Arlington and the surrounding areas, attorney David Kohm is on a mission to fight for victims’ rights in truck accident cases. David Kohm is a truck accident attorney who understands the trucking industry and has a wealth of experience in providing legal guidance and representation to injured victims. He and his staff are also involved in actively monitoring truck accident fatality statistics in order to stay up to date on prevention and reduction strategies. If you’ve been involved in a truck accident, the first thing you need to do is seek medical attention to ensure your health and safety. Even if you don’t feel any pain right away, you need to be checked out by the appropriate medical authorities. In some cases, pain and injury may not be apparent at the time of the accident, but days, weeks or even months later, you may begin to experience health problems. When possible, document everything related to the accident. Use your smartphone to take pictures and video, but also take down important information such as the time of day, the location of the accident and any details you can think of that pertain to what took place prior to, during and after the accident. This documentation can be very helpful to your attorney if you need to seek damages. Even if you aren’t able to thoroughly document the circumstances of your accident, the attorneys at the Law Offices of David Kohm can provide you with legal options to ensure that you receive compensation for injuries, pain and suffering, damage to property and more. Having a truck accident attorney on your side after an incident can make the process of litigating your case faster and easier, and in most cases, you will not need to provide any type of payment to receive representation. A truck accident attorney with the Law Offices of David Kohm may also be able to represent the interests of a loved one if he or she is unable to do so. A Dallas Truck Accident Attorney Explains How Obtaining Information from a 18 Wheeler’s Black Box Can Help Your Case. Learn How a Semi-Truck Accident Attorney Can Use Accident Reconstruction to Get Better Settlements for Your Injury Claim. Injured in a Accident with an UPS, FedEx or other Delivery Truck? See How A Truck Accident Attorney Can Help.